Hanging your photo on canvas on your wall is super simple and done in no time. We always deliver all our products, so also with our photos on canvas, with a FREE hanging system. The hanging kit of our canvases has been developed by us and patented. We supply a suspension clip, 2 screws and a short manual for each print. Measure the center of the canvas and place a line with a pen or pencil in the middle of the wooden frame. There is a small line in the middle of the hanging clip. With this you can place the clip in the middle of the canvas. 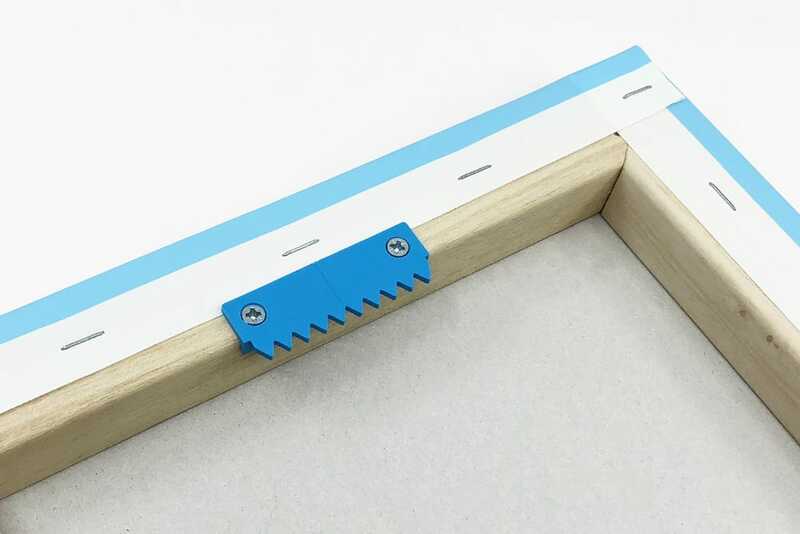 Next you can put screws into the wooden frame with a screwdriver. You can now hang your photo on canvas on a nail or screw on one of the zig-zaged side of the hanging clip. Even if you do not have the suspension clip mounted completely straight and your canvas is slightly tilted then you can move and shift it until the canvas is hanging straight. Do you want to hang your canvas with a thin cord from the ceiling or hanging rails? Then that is of course no problem. You can simply tie the wire around the hanging clip. I've ordered 5 canvas prints from you over the last week or so, to decorate a conference room and office ahead of a big meeting tomorrow. I just wanted to say thank you for your prompt shipments, helpful web chat (thanks Jennifer! ), and reasonable pricing – they look great on our walls! Canvas prints arrived today. I'm absolutely delighted with them, but more importantly so are my clients. Brilliant quality and first class service. I will definitely be using you guys again. Thanks for the canvas, I haven't seen it but it was ordered for a friend who said it was very good and she was happy to gift it to her sister. It is the only pic of her and her son (who has died) as an adult. We are extremely pleased with your service. After ordering a photo on canvas from your company I would just like to take the time to say a big Thank You for your excellent service, I ordered the canvas and immediately got an e mail saying I would receive an e mail telling me when delivery was due, when I didn't receive the e mail I phoned your company and spoke to a very pleasant man who told me where the print was up to, the following day I received an e mail telling me when my canvas would arrive and true to your word it arrived at exactly the right time. I am aware of how difficult it must be to get trustworthy deliver people, I have had nightmares with Tuffnells but the whole experience of buying from you is a very positive one so Thanks again, I will not hesitate to use you again or recommend you. Bastiaan, i wish to thank you and your team for the amazing job you did. I placed my order online yesterday and today at 2pm had the enlarged picture delivered; this is amazingly efficient. I appreciate a lot your professionalism and will spread the news. With best regards. Just wanted to say that I just recieved my first canvas from you guys... and I love it! It was a picture I took while on vacation in New Zealand, and I can't wait to get it up on my wall :) So, thank you very much, I will order more soon! Hello, Once again I have to let you know how very happy I am with the 2 canvases I have just received.